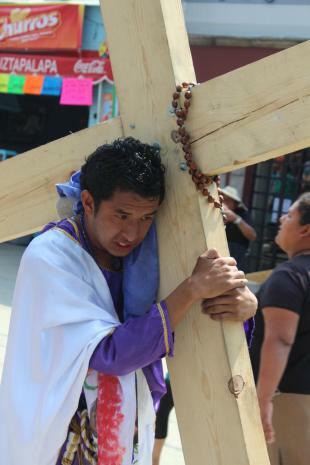 Eduardo Guzmán Flores, endured vows of sobriety and celibacy, in addition to a grueling physical training program, to prepare for his return role this year as the star of the Iztapalapa Passion Play, a community event since 1833. In the early 20th century, the various plays throughout Iztapalapa were consolidated into the single play, the venue, by design or chance, Cerro de Estrella, where the Aztecs consecrated the rebirth of their own world every 52 solar cycles, with a human sacrifice following a period of intense fasting and mortification. An estimated million people show up every year for the single performance … as always, beginning at noon on Good Friday. Australian photographer and travel writer, Peter W. Davies, whose photograph of Guzmán is reproduced above, wrote about the 2014 Play, which — with an additional touch of Biblical realism — featured an earthquake.